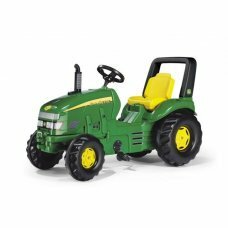 Rolly Toys X-Trac John Deere Kids Pedal Tractor. This little John Deere pedal tractor has an opening bonnet. It also has an adjustable seat. Front and rear hitch pins for the attaching of trailers & accessories. Suits form ages 3 to an average of 10 years old. Pictures might show a trailer, but this is sold separetely.